The Paul's Fishing Kites boat longlines on handspools are ideal for kayaks. Very compact and can easily be stored out of the way on the smallest boats. The 25 Hook Boat Longlines on a Handspool are an ideal system for smaller boats. These Longlines are very popular from small boats. Extremely compact and easy to set by yourself. Paul's Fishing Kites make a range of Hapuku Droppers either on 10 inch handspools or on 3:1 ratio longline reels. As the depth of water being fished varies considerably around the country, hapuku rigs are made to order. If you are interested in a quote of a hapuku rig for your area, drop us an email with details on the shallowest and deepest depths you will be fishing in your area and the number of hooks you wish to set. Photo : Alan Radcliffe (left), Paul Barnes (middle) and John Drummond (right) relax before trunking and icing these hapuku. 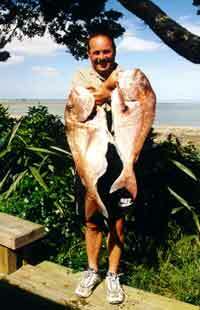 The 13 fish were taken on three sets of a 5 hook hapuku dropper stored on a handspool. 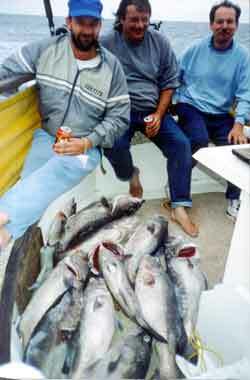 The fish were taken at the Mokohinau Islands in around 110 metres of water.